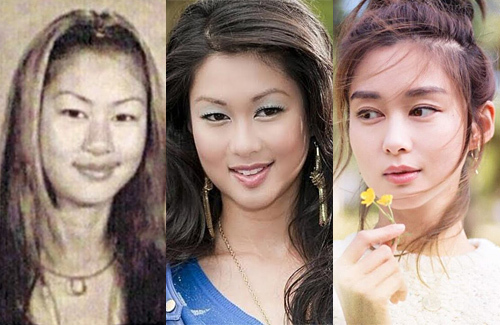 Eliza Sam Had Eyelid Surgery? Eliza Sam (岑麗香) is looking more beautiful and vibrant lately. Although this can be attributed to more rest time since the 34-year-old actress has a less hectic filming schedule after leaving TVB, sharp-eyed fans will realize that Eliza may have enhanced her beauty with surgical procedures. Comparing Eliza’s old high school photo with recent snapshots, she now has double eyelids. The eyelid creases are very apparent, even when Eliza’s eyes are half-closed. When Eliza was crowned Miss Chinese International in 2010, she was 26 years old and still had some baby fat on her cheeks. However, Eliza lost significant weight through dieting and exercise over the years, causing her face to look more sculpted with a stronger jawline. Eliza’s transformation is quite striking, and she evidently loves her new look as she often shares close-up photos on her Instagram. 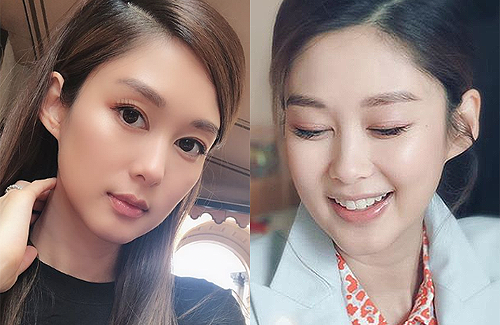 22 comments to Eliza Sam Had Eyelid Surgery? I’ve been suspecting it for so long. Finally, others also see it. Well, you can’t compare her pubescent photo. When I was younger I had thiner eyes and mono lids. Now my eyes look bigger and I have double lids. Never had surgery. I don’t even wear make up. But in her beauty pageant photo, she’s already developed. Also I don’t understand why people still call it “baby fat”. Normally baby fat sheds off at 18. I think that’s just plain old “fat” (not calling her unhealthy or anything). @birdy2415 Even her pageant photos show monolids. Besides, her creases are so prominent and large that it seems like they were altered to achieve such results. I agree the eyes are unnatural. What I meant is rest of the face. But it doesn’t necessarily have to be knife. It could just be injection. i think alot of it has to do w/ the weight and make-up technique. However, i don’t doubt the fact that she has gone under the knife for slight modifications. I’ve seen it for a long time, just don’t know why it took so long for others to bring it up. @m0m0 It’s either she uses eyelid tape or she had surgery. No makeup or natural process can result in such deep creases. @sugadough I think it’s tape, you can kind of see the tape in the last set of photos (the one on the right with pink eyeshadow). Definitely appears like it, though her eyes were never really small to begin with. Either way, I’ve never found her to be particularly pretty, and don’t get the hype over her appearance. Then again, I’m generally not a fan of the sweet & cutesy look. Definitely had ps to create those double eyelids, don’t she dare deny. I like how the media took the ugliest photos of Eliza in the past to compare to a nicer photo of her at the present. Eliza looks much or less the same now as she was when she was younger. If there were any cosmetic enhancements, it’s very subtle. Take it from someone that knows her personally. @anon I don’t think these r the ugliest photos. If u Google her beauty competition, that was what she looked like. saw similar article couple of years ago about her surgery. Eyelids? Small issue. Look at her nose. Everyone else might disagree, but I think she was pretty and had her own unique look in the first picture and the one below that. Now she looks undistinguishable from others with altered faces. It’s rather bizarre that females are dissed for being ugly when natural and then shamed when they undergo surgery. Wow the goddess isn’t all natural? Makes me feel better about being mortal lol. I think she did something to her nose too not just the eyelids maybe the eyebrows too? I think she got more prettier than before. This is a surprise? Name ONE person in the entertainment industry who hasn’t had something done. Double eyelids and nose surgery are so common. Some are just more subtle than others, but I have no doubt everyone has had something done. not surprised. I thought everyone knew about this? Why is everyone so shocked? Even some average Joes and Janes who have money go under the knife, have minor enhancements, get injections, etc… so wouldn’t celebs who rely on their looks to make a living not do it? We must be naive if we are in denial. It is just that celebs lie through their teeth about it thinking we are too stupid and blind to not know it or see it.